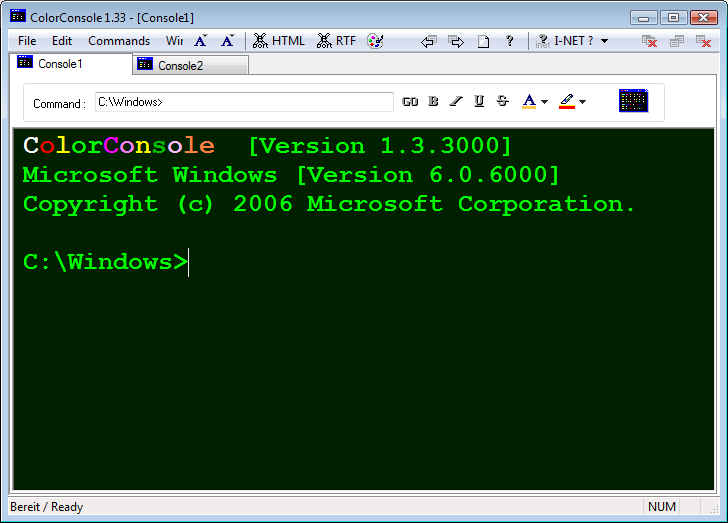 ColorConsole is an enhanced console with changeable font, style and color. Features include sizable window, multi-tabs, copy/paste/cut function, a fast folder switch, and export to RTF and HTML. How to extract: Download the "Portable" ZIP package and extract to a folder of your choice. Launch ColorcConsole_Portable.exe or ColorConsole_x64_p.exe (for 64-bit OS). What is the template to add commands to the menu list? Whatever i try it doesn't work. Anyone knows about other cmd replacement that allows you to save commands? Have u trying to move the file from Windows, not copying ?? It appears to be portable, but it does not appear to be "stealth". After running it on Windows XP SP3, I find 0-byte file ColorConsole_Portable.INI in folder c:\Windows\. That file is created in the Windows folder even when I run the application after copying file ColorConsole_Portable.INI to the the same folder as the application.